Your hair can be as special as the occasion. Special occasions call for special occasion hairstyles, and there are many options to create a stunning coif no matter what your hair length, budget, or preferences. By choosing carefully, you can have a magnificent style for any occasion. There are many occasions that may call for a special hair style. Parties and holidays, homecoming and prom, even weddings or other formal events all call for something with more flair than an everyday hairdo. Some occasions - such as a wedding or prom - may require more formal, elaborate styles, while a casual holiday party or homecoming dance may only need a mildly spruced up look. Whatever the occasion, there are many different styles you can choose from for a memorable and beautiful look. Before you choose one specific hair style, it is important to consider the different factors that can affect how you do your hair. 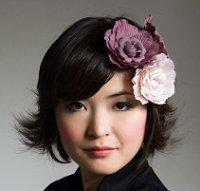 Cost: A very formal, salon-styled coif will be more expensive than an easy formal hair style that you can do yourself. Similarly, if you want to add hair highlights or other hair color to a new look, that will increase the cost of your style. Time: If you have all day to prepare for an evening event, you may be able to do a more elaborate style. If the even is short notice, however, a more casual but no less special style may be more appropriate. Look: How do you want to look for the occasion? Pictures are taken at most parties and events, and your hair can be a sleek, sophisticated look or an easy going, casual style. Face Shape: No matter what special occasion hairstyles you are considering, be sure to find the right hairstyle for your face shape so it complements your features. Attire: If you will be wearing very formal attire with a lot of detail, you will want a hair style that does not obscure your wardrobe, jewelry, or makeup. If your outfit is more casual, however, you may want to add additional elegance to your locks. Stylist: If you plan on styling your hair yourself, a simpler, easier style is best so you can feel confident about your look. If you visit a hair salon, on the other hand, you can get a more intricate style with ease. Mood: What mood are you projecting with your look? For a romantic evening, consider a sophisticated style or loose, gentle waves. For a fun, exciting event, curls and other styles that stay in place are best. After you have considered what type of special occasion is planned and how you want to look, you can consider the most popular hairstyles for special events. 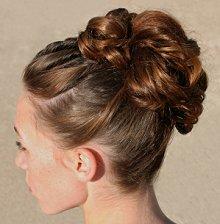 Updos: Classic and chic, updos are indisputably the most popular type of formal hair style. A simple French twist or basic updo style is sleek and elegant, while a half updo is a bit more casual and romantic. You can leave face framing tendrils to add softness to an updo, or consider a more elaborate updo with braids. Braids: Braids themselves can be perfect for a special occasion. Delicate micro braids are very feminine, while thicker braids can be elegant and sophisticated. French braids are great for medium or long hair, and elaborate braid twists turn this everyday style into a formal look. Loose: Leaving your locks loose is a quick and easy way to style hair even for a special occasion. Soft waves are romantic and elegant, while the natural texture of your hair will add body and movement that is missing from many formal hair styles. For added definition, consider highlights or hair lowlights shades, and don't forget the styling power of hair accessories to turn a simple look into something special. Sedu: Sedu hair styles are simple and sleek, particularly if your hair is normally wavy or curly. Loose sedu locks can be very chic, or opt for a partial updo or other style that shows off your straightened hair. No matter what hair style you choose, the best look will be healthy, vibrant hair. Be sure to eat a diet for healthy hair and drink plenty of water to nourish your locks from within, and use a good conditioner to protect hair from sun and styling. Hair vitamins can also help keep your hair gorgeous, and natural hair care techniques can keep you from abusing your hair. Accessories make any look special. Special occasion hairstyles can turn an ordinary look into an extraordinary one, but remember it isn't just your hair that makes the event special - it is the fun time you have with friends and family, and the confident way you feel knowing you look as special as the occasion you're celebrating.